“Awesome, exhilarating, stunning, spectacular, exciting”, these are the most common phases they hear. Gold Coast Adventure Flights offers the chance to ride in a powerful propeller driven Warbird aircraft, just like the flying aces of yesteryear. Embark on an exhilarating Aerobatic Flight or a thrilling Adventure Flight in a Russian YAK 52 aircraft over the stunning beaches of the Gold Coast taking in the vista of Surfers Paradise and the Hinterland. This flight is great way to introduce yourself to the world of aerobatics, its short but with plenty of adrenalin. From the moment you climb aboard this Russian YAK 52 aircraft, you will get the sensation of what it was like to be a World War II combat fighter pilot. From the moment you climb aboard this Russian YAK 52 aircraft, you will get the sensation of what it was like to be a World War II combat fighter pilot. During this aerobatic adventure flight, you will experience the thrill of an aerobatic routine involving exhilarating manoeuvres, medium to high g-forces, as you loop, roll and twist through the sky, with the spectacular Gold Coast City and beaches below you. This adventure flight is amazing! It has it all, fun, excitement and thrills, and is a fantastic introductory experience to the thrill of flying in a Warbird combined with the magic of the Gold Coast. They begin by soaring along the magnificent beaches of Surfers Paradise at 500 feet over local landmarks, such as Currumbin, Burleigh Heads, Q1 building, SeaWorld and the Spit, from there you will feel the power of the Yak52 as they climb to 1500 feet and track across the city and its sparkling waterways to Hinze Dam on the edge of the Hinterland before cruising back to Gold Coast Airport via Robina Town Centre. This adventure flight is a fantastic introductory experience to the thrill of flying in a Warbird combined with the magic of the Gold Coast. Take to the skies in a low level cruise north along the beaches of Surfers Paradise, soaring over local landmarks, such as Currumbin, Burleigh Heads and the Q1 building, abeam Main Beach you will feel the power of the Yak52 as they climb into the sky, before tracking over head Surfers Paradise for the return leg to Coolangatta. 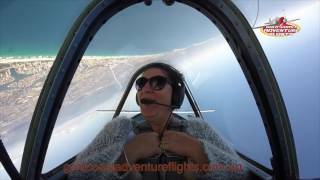 A unique and memorable flight-seeing adventure, taking in amazing views of the Gold Coast and Hinterland from Coolangatta through to South Stradbroke Island and Hinze Dam. Absolute Magic! Be mesmerised the picturesque views of the Surfers Paradise skyline as they soar along the magnificent beaches of Surfers Paradise at 500 feet. Abeam Main Beach, they will climb into the sky, to then track over head Surfers Paradise and fly by the top of the Q1 Tower. Take in the amazing views the Gold Coast has on offer, from the extensive man made canals and waterfront homes, as well as the great beaches and lush green hinterland.